For September Michael Tyler has created the perfect place to save and store you money. The Big Buck Bank project features a vcarve method to create engraved appearance of the front and back of an enlarged dollar bill. I got the inspiration to try this technique from a discussion on the Vectric Forum. The procedure used was to create thin component models of the front and back of a dollar bill image, import STL versions of each into separate instances of VCarve Pro 8, then create a finish toolpath with a large stepover setting to yield a line engraving effect. Available for VCarve & Aspire V8.0 users. How in the world do you do it. "import STL versions of each into separate instances of VCarve Pro 8"
Nobody over here would pay for one with a US banknote on it. I don't understand is how the two connected paths are created. First off how are you creating the raster vectors scan at 45 degrees from the STLs? What is in the STLs? Then once you have them are you by hand closing the ends of the two vectors to create the bounded V-Carve pocket? I would like to use this technique to create the illusion of a frog under the surface of lightly moving water for the top of a jewelry box. The PDF instructions that are in the project download explain how it's done. It's not done with a VCarve toolpath it's done with a 3D finishing toolpath using a V-bit. The finishing path has a wide stepover to give the lines and is set at a 45 raster angle. The bounded edge is just two rectangles, one offset from the other. The STL's were created by importing into Aspire using the Create Component from bitmap and then exporting as an STL. Thank you. After using some of your key words in your post I was able to recreate the carving and thus recreate the effect on the STL in the project files that you provided. Will now be changing the linear spaced vectored paths to non linear raster effect ( Ripples ) to make it look like the object below is being viewed through a refracting surface (water in my case) that has small ripples on its surface. Thank you all! I just read this thread today and I can honestly say "you've made my day"! YOU are my inspiration, encouragement and motivation. New be to all the 3D stuff. Outstanding work with the box. I was hoping you could help me figure out what I am not doing right. I ordered and downloaded two projects. The app file showed up, I ran it and it installed OK. But the PDF files did not show up. Could they be hiding on my hard drive some place? Did you download the PDF Files separately? Gizmo's Gadgets wrote: New be to all the 3D stuff. How do you know there should be a PDF with it? The projects I've bought from Design and Make didn't come with PDF's. They came with JPG picture files that are the guides which are installed in the same place as the project V3M files. The default folder is c:\users\public\public documents\Vectric Files\Designs&Make or the equivalent on your version of Windows. I'm making the Big Buck Bank right now. 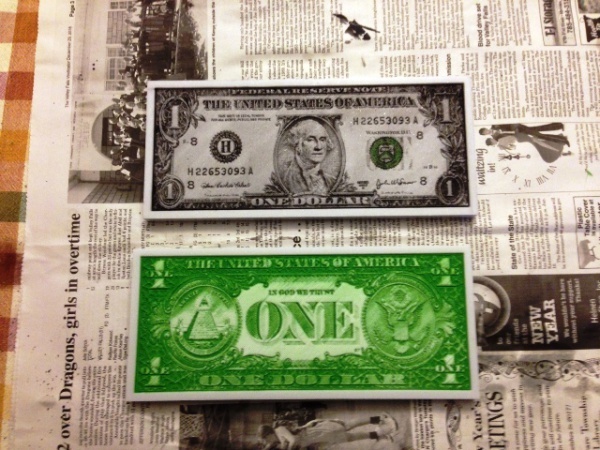 I cut the dollar bill image on a piece of light gray corian type material. It turned out much sharper than the one I cut from wood. Here is a photo of the bill. That looks great on the Corian (or whatever solid surface brand it is)! Can't wait to see more pics when you are done. First thanks for a great project. My wife gave our 4 yr old granddaughter $1 for helping her in the office. She promptly told her mother that her granddad need to make her a wooden bank for her dollar. I cut out the other parts on the table saw. I think if I make another I'll miter the box ends to spruce it up a bit. I used poplar for the construction and a 20 deg. V-bit for the detailing on the top.